Will and Darryl have been friends for a long time, but then Darryl says something nasty to Eloy, the new kid at school, and Will doesn’t like this at all. To show he doesn’t appreciate the remark, Will eats a stinkbug. It's an impulse reaction and Will thinks his popular days are gone after doing something that might be considered stupid. However, when he arrives at school he's being given the name Bug Boy and he’s actually more popular than he used to be. Eloy tells him bugs can taste deliciously when prepared well. His father is the chef of Will’s favorite restaurant and this makes Will curious. He declares himself an entomophagist and makes it his mission to inspire others to eat bugs too and a class project is his first attempt. Will needs Eloy’s help to make his plan succeed and in exchange he’ll teach Eloy everything he knows about wrestling. Eloy wants to join the school team and Will has been wrestling for years. Unfortunately it makes Darryl angry that Will spends a lot of time with Eloy. Will he be able to keep both of his friends or does he have to choose? And can Will’s newfound passion for bugs unite them or will it only make things worse? Boy Bites Bugs is a fantastic fascinating story. I loved Will. He isn’t afraid to be himself and follows his instincts. When he makes a mistake he apologizes and he’s a loyal friend. He messes up, but he also makes things right if they go wrong. He’s a great main character and I loved his interest in bugs, it’s truly inspirational. I enjoyed reading about his adventures with the creatures, they're intriguing, hilarious and surprising and the way Will handles things often made me laugh out loud. He might be struggling with an abundance of bugs, friendship dilemmas and insecurities about wrestling, but he never gives up and keeps trying. I really liked his story and read it with a big smile on my face. Rebecca Petruck has an amazing captivating writing style that drew me in straight away. I loved her vivid descriptions, she makes everything she writes about come to life in a terrific dynamic way. She clearly understands her main characters and their feelings and fabulously explores each layer of the problems they’re dealing with. This makes Boy Bites Bug entertaining, charming and a lot of fun with a great level of depth and plenty of wisdom. I highly recommend this wonderful book. Boy Bites Bug is meant for the 8-14 year age category, but is perfect for anyone who loves a great story about being brave and standing up for yourself and others. 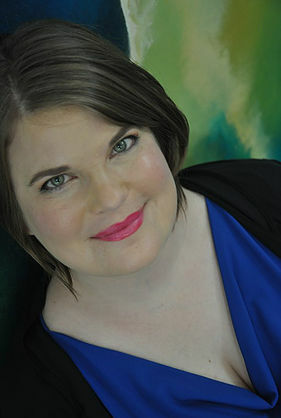 Rebecca Petruck is a Minnesota girl, though she also has lived in Louisiana, Mississippi, New York, England, Connecticut and, currently, North Carolina. A former member of 4-H, she was also a Girl Scout, a cheerleader, and competed in MathCounts. She reads National Geographic cover to cover. She holds an MFA in Creative Writing, Fiction, from UNC Wilmington, and is represented by Kate Testerman of kt literary. Her second novel, BOY BITES BUG, will be released by ABRAMS/Amulet, May 8, 2018. Booklist gave it a starred review, calling it "...a tale that is funny, perceptive, and timely in more ways than one." Kirkus Reviews said, "...successfully weaves together such important themes as bias, solidarity, and coming to recognize one's own privilege and prejudice, delivering them in a plot that is so very middle school (bugs! sports!)... An admirable feat that entertains even as it instructs." And School Library Journal said, "...the straightforward and uncluttered style will please lovers of the 'Wimpy Kid' series. VERDICT A sure bet for reluctant readers." Her debut STEERING TOWARD NORMAL is a Blue Ribbon winner as a Best Book of 2014 by the Bulletin of the Center for Children's Books (BCCB), an American Booksellers Association Indies Introduce New Voices selection, as well as a Kids Indie Next List title. Vanity Fair's Hollywood dubbed it a "book we'd like to see made into a film," the L.A. Times included STEERING TOWARD NORMAL in its Summer Books Preview, Christian Science Monitor named it one of 25 Best New Middle Grade Novels, it is part of the International Reading Association's list "Books Can Be a Tool of Peace," in the 2014 ABC Best Books for Children catalog, and an American Farm Bureau Foundation for Agriculture Recommended Publication. STEERING TOWARD NORMAL is a Housatonic Book Award finalist, and the BCCB gave it a starred review. 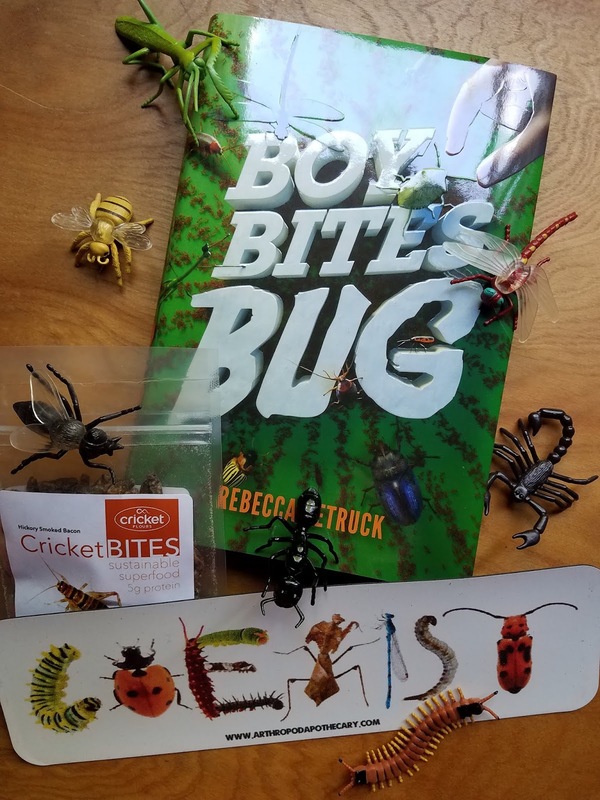 One very Lucky reader of With Love for Books will receive a hardcover copy of Boy Bites Bug, a COEXIST bumper magnet and a buggy treat from Rebecca Petruck. An interesting concept for a novel, I must admit that reading the review I had goosebumps, eating bugs is not a thing that I'd ever want to do. This book sounds like a lot of fun and very original! Thanks for sharing it. 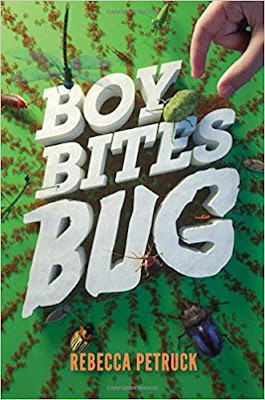 Boy Bites Bug sounds like a honest look at adolescent boy friendship combined with the fascinating subject matter of bug eating. Oh she would just love to read this! I can see my nephew enjoying this a lot. That cover is gorgeous. Eating a stinkbug--that can't be good for people! Be careful! I love how bright the cover is. love the cover! Bet the contents are just as fun! I know plenty of boys (and a fair few girls) who would love this book. What an uniqe cover! And Boy, does this story sound amazing! this looks amazing and I know my kids would love it! Not sure I want to eat bugs myself, but love the idea of the novel. This is wild! I used to babysit a little girl who ate worms!